I had a very busy evening, photographing a classical Indian concert, and getting home around midnight - having to eat, download pictures, and prepare my camera for a bridal shoot early tomorrow morning! I called my Mom enroute home to see if she had any leftovers, and she did have a half pizza shell that she had made. 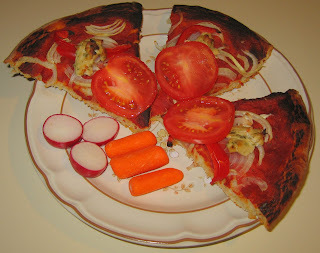 I picked it up, added some onion, bell pepper, and dollops of Scottish vegan "sheese" "cream cheese" (Cheddar style with chive), as well as, just before serving, slices of fresh tomato. My Mom makes very nice pizza (she learned from an old Italian woman who became my Grandma Sapienza when we lived in Findlay, Ohio when I was a young child)! 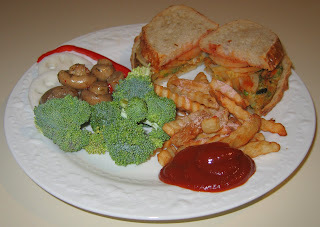 Last August, I purchased Dr. Praeger's California Veggie Burgers and really enjoyed them. I bought them again and made a simple dinner tonight, grilling some onions and a burger on my cast-iron pan, and serving it with French Fries and a salad. My wife made it safely to Mumbai! Her family in her hometown will be quite excited and surprised to see her tomorrow. After the photography class that I taught tonight, I came home and made a quick but good dinner. I wanted to prepare it quickly, as I've been watching a multi-night film on television. Ken Burns, probably the most influential contemporary documentary filmmaker (whom I've met at our annual documentary film festival), has just released his new film, the epic 900-minute The War, a 6-year effort (of which we saw a few hour preview at the film festival last year) that tells the story of World War II bottoms-up from the points of view of common people involved in the war. It's been fascinating to watch. 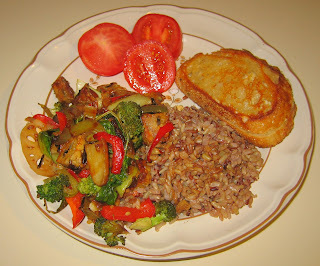 Anyway, I simply heated the lotus root-tempeh stirfry from a few days ago, and, on my cast iron pan, made a grilled "sheese" (Scottish vegan cheese) sandwich. It was filling and good! For her long journey to India, my wife asked me to prepare some Field Roast "Grain Meat" Company's handmade stuffed (with apples, squash, and mushrooms) Celebration Roast sandwiches this morning. Tonight, I used up the remaining portion; it's a tasty, dense, and filling treat, and just requires heating (or not). I served it with mashed potatoes and grilled asparagus. I promised my wife that I would help her to keep a surprise and, since I know some of her family like looking at my blog, I've not annotated this or the next few entries for a few days (it is now Wed. October 3). She likes to visit her family in India in mid-October, but her niece, who turned seven I think on September 30, had as a wish that her aunt would be there for her birthday party. So, my wife arranged to visit and left on Thursday, meeting the one relative that she told at the airport in Mumbai when she landed. A day there, then she took the overnight train to her hometown and surprised her family when she rang on their doorbells the morning of her niece's birthday! Since my wife is leaving for a 2-week or so visit to India tomorrow, I was thinking about my own overseas travels and what foods I miss the most - tempeh ranks high. So, I made a stirfry with fingerling potatoes, sliced lotus root, and broccoli. We enjoyed it! Tonight's dinner was one of the tastiest ones I've made in a while! I wanted to use up the remaining "artihearts" (grilled artichoke hearts) from yesterday. I cut a medium onion into thin half-moon slivers maybe 1/4" thick and started the slivers sauteeing in a little canola and Mongolian Fire oil for a few minutes over medium-high heat. As the onion started to become clear, I added about a teaspoon of finely chopped ginger and 1/4 of a medium jalapeno (all I had; I would have liked to have used a half jalapeno pepper) that I had sliced into approximately 1/8"x3/8" pieces, as well as a half bell pepper that I had sliced maybe 1/4"x3/4". A minute or two later, I added the artihearts (all that was left, maybe a third of the packet) and the limed seitan strips that I had left from Saturday's potluck (about a quarter cup?). In the meantime, I had some thin rice noodles soaking in very hot tap water for about 10-15 minutes. 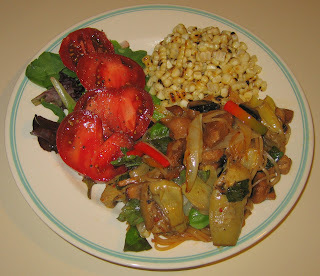 I then drained and rinsed the noodles with cold water and kept them ready for a quick stir-fry. About two minutes after adding the seitan and artichokes, I put the noodles in, as well as a tablespoon or so of soy sauce. I stirred for a minute and a half, turned the heat off, and finally added about a dozen basil leaves that I had roughly hand torn into approximate quarters. It came out great! I served this with some corn-off-the-cob that I had added Earth Balance margarine, salt, and Volcano Lime Burst (water, organic lime juice, lemon oil) to. Pizza! 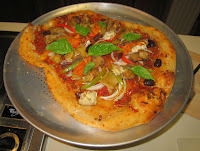 I've not made pizza from scratch in a number of years; I typically buy a prepared shell and use it as a starting point. It wasn't really from scratch as I purchased frozen pizza dough (I'm not good at kneading and used to, years ago, use my bread maker to prepare the dough to truly make pizza from base ingredients only), but I made pizza today. I was going to enlist my wife's help as she is good at handling dough, but I managed to prepare a (not very round!) pizza pie tonight. At the gourmet store in Chapel Hill that I occasionally visit, A Southern Season, I found this nice set of sauces, handmade in small batches it seems, and sold in small bottles, from a Sicilian company, Antichi Sapori di Sicilia. One of their sauces, Pesto alla Trapanese, is a Sicilian pesto made with tomatoes, oil, almond, basil, garlic, salt, and pepper, and it is what I used tonight. I also had recently purchased grilled "herbal" artichoke hearts ("artihearts") from a company named Monterey Farms herbal artihearts. The instructions for the pizza dough specified to defrost the dough for about 2 hours (luckily I didn't notice and allowed ample time; when I checked about 6 hours after I had taken it out of the freezer, hoping to start cooking in an hour, it was still not defrosted, but was fine an hour later - I wonder why? ), preheat the oven to 425°F, spread the dough into a pizza round (I didn't follow it exactly, but I found a nice video online), lightly oil or coat with a little sauce, then parbake (partially bake) it for 5 minutes, let it rest for 5 minutes, top it with additional sauce and toppings, then bake it for 10-14m. What I did was to, keeping flour on my hands, shape the dough ball and slowly press it down into a circular shape. I put maybe a teaspoon of olive oil around the nascent crust and used my fingers to uniformly coat the crust, and pressed down perhaps a half teaspoon of raw sesame seeds onto the crust. I sprayed a little bit of oil elsewhere on the dough's top and pressed into the dough about a tablespoon of roughly chopped rosemary needles. 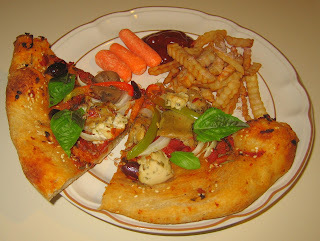 I took the pizza out after 5 minutes - the crust, thankfully, was hardening so the pizza came out fairl easily. I let it sit for 5-10 minutes, then finished saucing the top, then added the toppings (the artichoke hearts, yellow sundried tomatoes, Kalamata olives, onion slivers, and marinated mushrooms; on my part, I put a few teaspoons of Scottish Isle of Bute vegan "cream cheese" with chives). I then baked the pizza, again directly on the stone, for about 11 minutes. I think it came out well, though I wish I could make a uniformly thin crust. My wife found that her pieces were too thick and didn't enjoy the pizza as much as I did. I also served it with some French Fries. 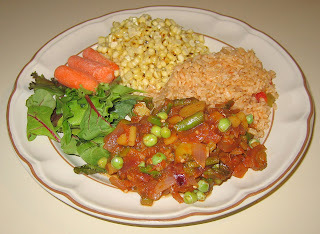 Yesterday, we had my favorite vegetarian society potluck of the year, the (tenth!) annual joint meeting with a very nice group, NC Society for Ethical Culture. After we eat, I moderate a panel of three persons from this group and three from Triangle Vegetarian Society. Panelists address (in six minutes only!) the question "What are the two or three most important issues of our times and what, as individuals, can or should we do about these issues?" It's always an interesting time and coincidentally a few hours before the event somebody who tapes and edits audio material asked if we would like to podcast this or any of our events! I think that the audio from our discussion will be available at www.archive.org/details/TriangleVegetarianSociety . Anyway, I came up with an idea for a new dish and made it for yesterday's potluck; I'll try it again sometime as a main course at home. I cut two packets of seitan into thin strips maybe 1/4" x 1" and baked it, covered in lime marinade, for about a half hour at 350°F. I also baked half of a yellow onion, cut into thin half-moons and with a little olive oil drizzled over the pieces. I put into my rice cooker a vegan bouillon cube along with maybe a cup of a mixed wild and brown Lundberg brand rice and twice as much water, and let it cook for about 50 minutes. I mixed the cooked ingredients together, along with a little salt. It was good! On Friday, I was photographing a concert and, before that, scoping out Duke Gardens for a bridal shoot that is coming up. Unfortunately, I ran out of time so went with my wife to eat falafel. On Thursday, we made a new vegetarian friend who contacted me to possibly get some photography tutoring; she just moved here a week ago. She joined my wife and me after my photography class and we ate Tex-Mex food (I had a spinach and a tempeh enchilada) at Margaret's Cantina. Phew! Sorry for such a diary-like long posting today! I had the cornmeal mixture leftover from Monday, so used it up tonight making what turned out to be a much less interesting dinner. I cut asparagus spears in half and, like on Monday, coated them with Annie's organic Baja Lime marinade, then baked it in the oven at 350°F, but for only about 20 (instead of 30-40) minutes. I also took a portabello mushroom cap and sliced it into sixths, and treated it the same way. Like on Monday, I took the vegetables out of the oven and gave them a few minutes to be cool enough to handle. I dredged them through the cornmeal mixture then sauteed for about 2 minutes, flipped, and sauteed for about 2 more minutes before serving next to mashed potatoes. I also made a simple sweet onion and heirloom tomato salad by mixing in a tablespoon of pesto and a little salt to chunks of a medium heirloom tomato and a quarter of a medium sweet onion. I was a little tight on time, so just heated up some organic canned baked beans with maple syrup (sometimes my stomach gets upset with beans, especially those like kidney beans, but I usually sprinkle a little ground ginger on top, which may help; today there was no problem) as a side dish. 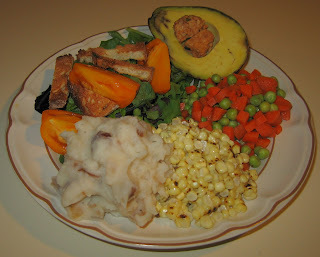 Dinner was okay, but I much preferred the seitan dish from Monday. I sampled the asparagus when it first came out of the oven and really liked it. 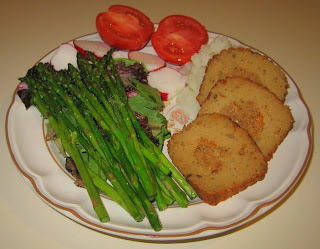 Sometime, I'll make a simple side dish of asparagus prepared this way and not breaded. I may make a dinner at some point with a combination of portabello mushroom and seitan, encrusted in cornmeal. I made a simple dinner tonight out of Medallion Ligurian Pasta, as I described when I first cooked with it last week, and leftover tomato sauce. I cut two vegan Field Roast Grain Meat Company apple-sage artisanal sausages into 3/8" discs, then cut those discs in half. I sauteed the sausage for a few minutes, then added half of a medium shallot, finely diced, and cooked for just a few more minutes, till the sausage was slightly browning and the onion was clear. I mixed this into a sauce pan where the leftover chunky tomato and green pepper sauce was simmering, and continued the simmer for less than five minutes. I added a tablespoonful of pesto and four quartered large green olives, mixed, and served over the pasta. I also served a salad, including Cincinnati radish, and whole wheat toast with roasted yellow tomatoes. Since I made Beet Mashed Potatoes at the end of August or when I grilled a couple of weeks ago, I feel that I have made good meals, but few exceptional ones. 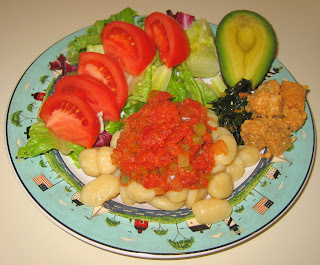 Today, however, I was very proud of dinner; if I ever opened a restaurant, this meal might be one that I would feature. It was based on an idea that I came up with this afternoon of making something like seitan croquettes, but with a brief saute instead of deep frying. I started with an 8-ounce box of seitan; I tried to pick out a sample with big chunks of seitan. I cut the seitan into pieces approximately 3/8" thick and very roughly 2" square - of course it varied as per the individual piece of seitan. I put the seitan slices on a baking plate and covered it with Annie's organic Baja Lime marinade, then baked it on a low-heat 350°F oven for about 30-40 minutes; little marinade was left and the seitan had hardened a bit. Into a metal work bowl, I put about a cup of medium-ground organic cornmeal, a teaspoon or so each of chili powder and sesame seeds, 2 tablespoons of Eat in the Raw's Parma! vegan "Parmesan cheese", and maybe 1/2 teaspoon salt. I dredged each piece of seitan, still moist with marinade, in the cornmeal mix, then I sauteed all the pieces over medium heat for about 2 minutes, before I flipped and sauteed the other side for 2 minutes, resulting in a medium brown color of the coating. The coating held on well - the marinade was a good idea (my original thought was to use maple syrup, but I'm glad I went with the marinade instead of introducing a sweet flavor - though I'd like to try that sometime). Fibrous and with many subtle flavor, it tasted great with mashed potatoes. I also made some green kale, similarly to how I did in early Februrary, but with a sweet onion instead of kale. I hand tore the kale leaves from the stems so that the leaves were roughly 1" squares, then cut the stems into 3/4" lengths. I cut a medium-sized sweet onion into a 1/4" dice and sauteed, in a tall sauce pan, for about 5 minutes over medium-high heat till the onion was softening and becoming clear. I added 1 teaspoon cumin seed and , kale stems cut into 1"; 1 minute later, I added a vegan bouilloun cube and water to fill the pan about 2/3, allowing space for the kale leaves. I brought this to a boil, uncovered, for 5 minutes, then added the leaves for 5 more minutes. I saved the liquid (using some of it for the mashed potatoes; my wife drank a cup of it; and I saved the rest potentially for cooking over the next few days) and served the drained kale with some jerk seasoning on top. I wanted to make tonight's dinner a particularly good one, as I haven't been able to cook for a while. On Thursday, we went out to Panzanella after my photography class - I had their yummy vegan pesto pizza, sans cheese, with artichoke hearts, roasted garlic, and fresh tomato. We flew to Bloomington, Illinois on Friday for a Saturday wedding that I photographed. The twin cities of Bloomington and Normal number a total of only about 110,000 people. There, I enjoyed a small all-vegetarian (and almost all-vegan) grocery store, Common Ground (where I purchased some organic hand-made vegan biscotti from Amy E's Bakery, based in Moscow, Idaho; I hope that I can get our local stores to carry her products! ), and a great place to hang out in downtown Normal, the all-vegetarian Coffee World Coffeehouse. I used to live in the Midwest when I was a child; the folks are almost uniformly so kind! I enjoyed making friends with a vegan woman who works at the Common Ground and her boyfriend, a vegan who cooks at the Coffeehouse. The owner of the store asked me to bring several copies of my cookbook, and the owner of the Coffeehouse purchased a copy. We ate at the rehearsal dinner on Friday and had spicy Indian food at the wedding. On the way back on Sunday at our layover in Atlanta, we found Nature's Table Cafe and enjoyed hearty vegan vegetarian soup, as well as salad and fruit; they had some tempting pesto pasta - the manager said the pesto had no cheese and was vegan, but he didn't know about the pasta and whether it had eggs. I also had a tasty smoothie from Freshëns with coconut milk and ten juices. It would be great if PCRM would do an updated and more detailed airport restaurant guide! I have come to really like rice noodles, and it's been a while since I've cooked with them. I set some noodles to soak for about 10 minutes in a bowl of hot tap water. I made a simple dinner by cutting a dozen or fifteen Brussels sprouts into halves or, for larger ones, quarters, and sauteed them over medium heat along with a medium red onion, sliced into thin half-moons. A few minutes later, I added two 6" stalks of rosemary to add flavor to the olive oil, as well as a few drops of Mongolian Fire Oil. When the sprouts had browned, in maybe 10 minutes, I removed the rosemary stalks and added in some fresh herbs, roughly chopped; maybe a teaspoon of rosemary needles, a half dozen or more basil leaves, and a dozen oregano leaves. I also added some vinegar-based hot sauce, a little soy sauce, and a little salt. I also added the noodles. I cooked, stirring, for a few minutes. I also grilled, with very little oil, on my cast iron pan, some asparagus spears, which I served with fresh lime juice, salt, and pepper. In the store today, I found a discounted guacamole kit that looked (but ended up tasting only "okay" - the avocado was rather watery) good, and just mixed in the tomato-onion package with the avocado paste (when I make guacamole, I leave plenty of lumps, but this really was like a paste). I also mixed in a little rosemary, as I do when I make guacamole. Tomorrow is my photography class, but my wife may not join me to eat out afterwards. If any of my students want to join me, I'll eat out, or I may come home and make something just for myself. Like many others, I still feel quite moved by September 11th and each year since the tragedy, have looked for commemorative events. I didn't find any local evening events so just had a quiet day at home. I sure hope that we can move to a more peaceful and loving world; surely a plant-based diet is a great way to orient toward such a world! I made a relatively simple dinner today. 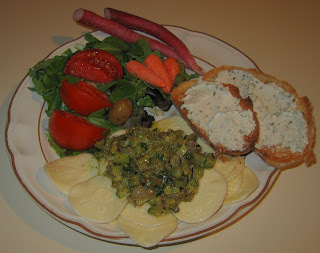 I made mashed potatoes, and mixed in small, flattish Italian cipolla onions that had been marinated in oil. I cut the onions into eights, and then halves again. I also included some extra virgin olive oil, salt, and pepper. I made fresh peas and carrots by using English peas and chopped baby carrots. I boiled the carrots for about 7-10 minutes (I was surprised it took so long) till they were starting to get soft, then added the peas and cooked for another minute or two. I mixed in some jerk seasoning. I also made flame-roasted corn-off-the-cob with Earth Balance margarine, salt, and a little fresh lime juice. At a local gourmet store, I recently found croxetti pasta (from the Italian company Costa dei Rosmarini), disc-shaped and originating in the Middle Ages in Liguria (northwestern Italy near France) when high-class families would show off their coats of arms, even imprinting them on their pasta. The dimensionality of the imprinting helps the pasta hold light sauces reasonably well. I read that walnut sauces go well with this pasta and, since I have walnut oil on hand, I should explore that. I made a simple saute over medium heat of one medium zucchini, finely chopped (1/4"), and a medium shallot, similarly chopped. When the zucchini was soft, in maybe 10 minutes, I took it off the heat and mixed in some pesto sauce, and served over the pasta, which takes 15-16 minutes to cook in boiling water till al dente (just as the package directions had suggested; the pasta is fairly thin, so I was surprised that it took that long). I also served a salad including Cincinnati radish (a first for me; rather strong in flavor) and lemon rosemary toast with Isle of Bute Foods' Scottish vegan "cream cheese" with chives. We enjoyed dinner! Unexpectedly, I didn't do any cooking over the weekend. We had a great time canoeing with a friend yesterday and went out to eat Lebanese food (falafel, hummus, baba ghanouj, ...) at a small family-run restaurant on Ninth Street near Duke University in Durham. On Saturday, we ended up in Whole Foods in Raleigh after a fun hike; my wife was hungry so we ate there (a variety of dishes from the hot and cold salad bar, and slices of cheeseless vegan pizza) before doing some food shopping, then enjoyed walking around downtown Raleigh for a while. I made a simple dinner tonight. I chopped some fingerling and Cranberry Red potatoes into large chunks and began boiling them for a few minutes, after which I added chunks of baby carrots. 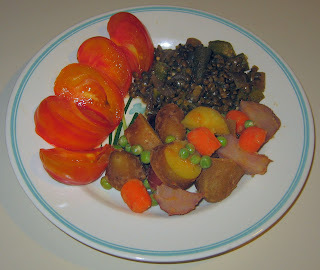 When the carrot and potato were almost cooked but still firm, I added a handful or so of English peas and cooked just for another minute or two. I drained the water and mixed in a Thai peanut satay sauce and some salt. In parallel, for about 3 minutes, I sauteed a little red onion and okra, adding a half teaspoon of cumin seeds in the last 30 seconds. I then added French lentils and water in a 1:3 ratio, as well as a pinch of turmeric and several pinches of salt, brought it to a boil, then reduced the heat and simmered, covered, for about 35 minutes. Yesterday, I had a new photography class that started. My wife and I took several Korean friends of ours out to Sage Vegetarian Cafe where my wife and I shared the pomegranate reduction with tempeh that we so love, as well as an eggplant dish. Almost two weeks ago, I had made a pasta dish with a locally packaged Indian-Italian fusion bottled tomato sauce (containing "tomatoes, onions, peanut-oil, garlic, salt, oregano, red chili powder, cumin, coriander") from a company named InFusion Foods. I had about a third of the bottle left, and was much more satisfied with how the sauce shined in the dish that I made today. In a nonstick saucepan, I did a quick saute, using canola oil (and later adding a little Mongolian Fire oil), of about a quarter of a red onion, medium diced, and a large fingerling potato, cut into small, maybe 1/4" x 1/4" x 1/2", rectangular pieces. 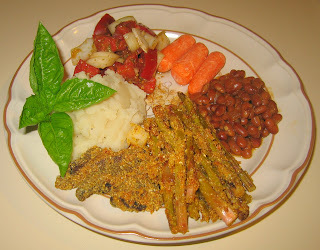 As the potato softened, maybe 10 minutes later, I added asparagus, cut into 1/2" lengths; three small okras, sliced into thin 1/4" or less discs; and perhaps a half teaspoon of whole cumin seeds (I would have liked to have added grated ginger, but couldn't find any in my refrigerator). I continued cooking, stirring occasionally, for another 2 or 3 minutes (being careful to not burn the cumin), then added the sauce and several tablespoons of English peas, and let it simmer for a few minutes before serving. I also served brown basmati rice. I seem to be out of vegan bouillon cubes, so cooked the rice in water plus two tablespoons of the leftover simple tomato sauce that I had made at the beach this past weekend. I also roasted three ears of corn the way I normally do over the open flame of my gas range (I came up with a new technique to keep hands further from the flame - in shucking, I didn't remove the covering, but folded it back so that I had a long "handle" to hold), then added salt, fresh lime juice, and Earth Balance vegan margarine. Dinner was good! I would like to purchase more InFusion Foods' sauces (or try making similar sauces in my slow cooker) and experiment with dishes more Indian like today's main course, rather than Italian pasta ones. Tomorrow, I have a new 6-week photography class starting (as always, it's full with a wait list, and I have emails asking to be let in to the class! ), so we'll be eating out. But I'm planning on a nice home-cooked dinner on Friday. I had good luck grilling almost two weeks ago (time flies!) and I had two frozen Dominex eggplant burgers left from the box that I picked up for cooking at the beach this past weekend. 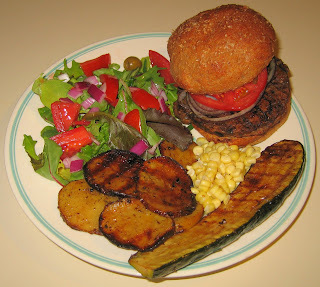 So I thought that I would grill the burgers and also further experiment with grilling vegetables. Like last time, I started the grill with the bottom vents open and no top cover after having hickory wood chips (less than last time as it had contributed too strong a flavor; I used perhaps a half handful) and rosemary soaking underwater for 20-30 minutes. Once the pyramided charcoal was white hot, my wife spread the charcoal across the grill; I drained and then tossed in the herbs and wood chips and covered with the top vents open. I let the heat build up for a few minutes, then added several Yukon gold potatoes that I had first marinated (I had sliced the potatoes to maybe 1/3" thicknesses and marinated them for at least a half hour in Drew's rosemary balsamic dressing/marinade), as well as a zucchini that I had cut longitudinally into approximately a 1/2" thickness. I had also marinated the zucchini in a combination of maybe a tablespoon of olive oil and a tablespoon of canola oil. I let the potato and zucchini cook for about 12 minutes, then flipped them. 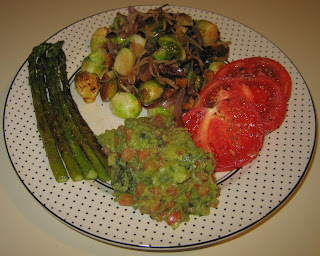 About ten minutes later, I removed the potato - surprisingly, it was done while the zucchini was not. I mixed into the potato maybe 1/2 teaspoon of dried dill and a little salt, then it in a bowl in a low heat toaster oven to keep it warm. 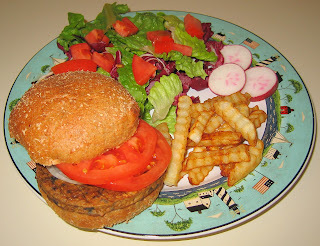 At the same time as I removed the potato, I put in the eggplant burgers after spraying olive oil on both sides. I bought some corn today and thought that I would experiment with one cob; I shucked it (removed the greens and silk) and put it on the grill, . I thought that it would cook quickly, but left it in for 15 minutes, turning it once, and found the corn kernels had become brighter yellow, but there was no browning yet. I also noticed that the grill wasn't as hot as it probably should be; next time I should use more charcoal (I used maybe 16-20 pieces). I also put in buns for about 7 minutes (I had sprayed a little olive oil on the inside surfaces) and ended up letting the burgers cook for about half an hour, flipping once in the middle (the manufacturer suggested an 8-minute grill, so surely the grill was not very hot by now). I decided to prepare the corn differently than usual. I stripped it and added salt and Earth Balance margarine, but no lime/lemon juice. The corn ended up being good, with firm kernels and a nice mellow hickory smoke flavor, though neither my wife nor I thought it was better than how I usually make it. Here is a summary of the grilling timeline. After checking out of our beach condominium on Monday morning, we enjoyed our last day of our long-weekend vacation exploring, and ended up in Wilmington, NC. We ate at Old Chicago, a pub-style restaurant specializing in Chicago pizza, pasta, and beer. It turns out their deep dish pizza crust has animal products (as I recall, egg or milk) mixed in each morning, but the thin crust and stuffed pizza doesn't. Neither of us has ever had a stuffed pizza, and it sounded appealing. It was! We had a pizza without cheese, of course, but with artichoke hearts, roasted garlic, and spinach. They served additional sauce on the side, which I enjoyed putting on top of the pizza. Yum! We had a great full day at the beach with fabulous weather in the mid 70s and the ocean, with moderate waves, of temperature around 82-83°F! Too bad that we have to leave tomorrow morning. Tonight, I made another simple dinner. I had some packaged potato gnocchi (pasta stuffed with mashed potatoes) which simply needed to be boiled for a few minutes then drained. Though it's so simple, I've not prepared it for a number of years. I made a simple tomato sauce; I sauteed in the one pan that I brought (actually an aluminum sauce pan, but it worked well for a quick saute) a small onion, finely chopped, and most of a bell pepper, also finely chopped. I cooked for just 2 minutes or so, then added a small box of organic diced tomato, and simmered on low for 10 minutes or so. I wish I had my fresh herbs! The kitchen had some dried herbs, which I helped myself to - maybe a half teaspoon each of basil and oregano. I also added a few shakes of salt. 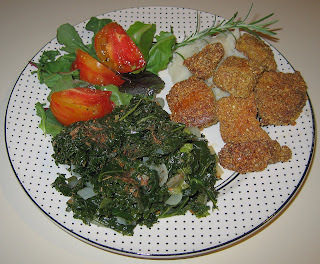 I served the sauce atop the gnocchi, along with some tempeh and a tiny bit of something I hate but know it's good for you - seaweed, which my wife had picked up; we got the sides from a nice cooperative grocery store that we like in Wilmington, NC, called Tidal Creek. This coop has a prepared food section that is all (or mostly?) organic and almost entirely vegan! We're at the beach! We love visiting a quiet beach area near Wilmington, NC called ... well, a friend who turned us on to this place discouraged me from telling too many other people so that we can keep it quiet and clean here - even this Labor Day weekend, we could swim and only see maybe three others nearby in the relatively clean and quite warm water! Let me simply say that we are renting a lovely 3-bedroom (all that was left with an oceanfront view) condominium a very short two-minute or so walk from the ocean. The rental includes a fully furnished kitchen. We were surprised when we first came last year that the restaurants nearby are not vegetarian friendly; even the Thai restaurant nearby had fish sauce in most everything. But home cooking is an option! If possible and convenient, I prefer to use my own pans and cooking utensils, so brought a single aluminum stock/sauce pan, though I didn't need the pan today. We got to the beach in time for enjoying an hour and a half or so of a dip before dark. After showering, I got to work in the kitchen and made a simple meal. 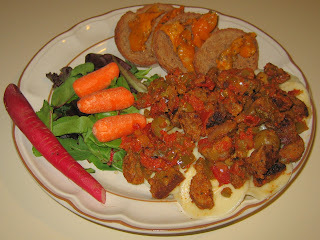 We picked up from a coop in Wilmington, NC, a nice product, Dominex eggplant burgers. I've enjoyed their eggplant cutlets before, but haven't seen these burgers before. I simply heated them, as well as some organic french fries, in the oven. We also picked up some good organic and vegan buns (finding a vegan bun is not always easy; often dairy or honey is included). The burger was very good! We have two left; perhaps I'll use the grill back home next week and grill these plus other items. We do have the rest of the 8-pack of buns to use, too. By the way, Claire Cusick, the food columnist for our weekly entertainment paper, The Independent, had emailed me that she was going to feature this food blog in this week's issue. Indeed, I brought the paper with me and found a nice writeup, which I'll reproduce here! In response to my query a few weeks ago about area food blogs, Dilip Barman alerted me to Dinner with Dilip (dilipdinner.blogspot.com). 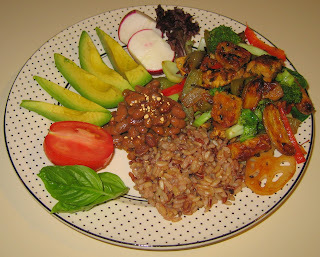 Barman, who is the president of the Triangle Vegetarian Society (www.trianglevegsociety.org), chronicles his daily dinner-making adventures. Since meeting his wife in June 2004, he has cooked for her almost every night, he says, and has yet to repeat a dinner. I cut about a dozen small fingerling potatoes in half, longitudinally, and started them sauteeing in a little olive oil (I always use extra virgin) over medium-high heat. A few minutes later, I added tempeh - I used about 2/3 of a package and cut the tempeh into small pieces, maybe 1/2" x 5/8" - as well as a 1/4" chopped onion. 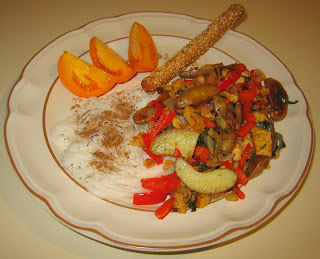 Stirring occasionally, when the tempeh started to brown, I added a full red bell pepper, cut into thin strips. A few minutes later, I added a handful of fresh basil, cut coarsely into maybe quarters, stirred, and served a minute later. On the side, I had some boiled rice noodles topped with Jamaican jerk seasonings. My wife liked dinner and so did I, but I think it was a little below average. It could have used more flavor; I ended up adding a little salt to her main course and reduced sodium tamari sauce to mine, but some sort of marinade or other flavoring would have helped. Yesterday, a friend (the best man at my wedding) invited my wife and I for canoeing and kayaking after work. We had a lovely time paddling with him - I tried, at the end, kayaking (I don't swim, at least not well, so avoid kayaks that may flip!) for the first time ever, and it was even more fun than canoeing! We stopped at Sitar Indian Restaurant for dinner - I had masala dosa and we shared pakoras, steamed rice idlis and sambar soup, and salad.